it is alive. Was it not rooted down, it would have just lifted up and flown away carried by millions of bees. If I close my eyes, I can feel the air vibrate around me. I can feel my skin tingling. Laden with pollen the bees buzz and spread their love to other flowers and plants. And that’s how life continues. One bee at a time. To the contrary to many people’s thinking, desert is the most vital and diverse environment. Often things are hidden from plain view. Just add water, wait a few moments and presto. Instant life. And this is another incredible thing! Plants grow out of sheer rock. How is that possible? 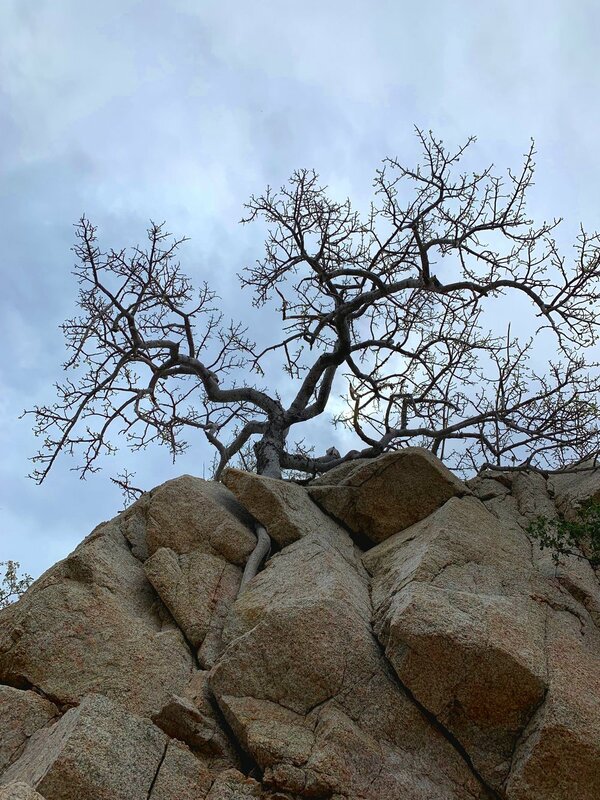 Granite vertical wall and the Desert rock fig tree grows straight up seemingly without any soil. It's milky white roots clasp the granite wall like tentacles of the El Pulpo. They find the way through the cracks and they not just live but flourish vigorously. So much to learn from nature around us about how resilient as humans are as well. We tend to thrive when we struggle most in our life. We don’t necessarily enjoy the process when it is in the most painful stage. But, in the end, if we do survive, we are stronger and in many ways more alive and aware of things that are around us. On a walk through the arroyo today, I looked under a rock. Like a translucent sculpture, a perfectly formed wasp nest stared back at me. I pass a flower I don’t know the name of, so I get closer to take a photo. I disturb a beautiful orange colored butterfly. So, my flower just flies away. Little further down, Palo Verde tree is in full bloom with tiny yellow delicate flowers. Spring has arrived and its blooming time. I take a few seed pods which are hanging among the blossoms. I want to see if I can sprout them and grow a tree in my yard. They are very drought tolerant plants. More birds and bees will come to visit. Nature adapts as do we. Often the best wine comes from old grape vines which grow in dry and rocky soil, so the roots have to develop deep and struggle to get to the water. Because they grow and mature so slowly, the fruit they produce has the most intense flavor. Pure wisdom. So, embrace life when it gets tough. You will discover new ways to make it meaningful again. You will find beauty all around you because it will reveal itself to you in a new light. Now go out for a hike, open your eyes and look under the rock. You just might find something worth finding.